The life of Kansas City native Jan Sher-Tuckerman is a complex tapestry of wide ranging influences giving her a unique creative range, unusual not only for its formal artistic qualities but also in its philosophical foundations. The daughter of a scrap yard owner, she developed an early appreciation for found and seemingly ephemeral forgotten objects. With her father encouraging this spirit of imagination and re-invention she became a serious student of collectibles with a keen sense of the history, form and material composition of her objects of study. Some time after receiving her Art Education degree at Arizona State University in 1976, Jan returned to Kansas City where she became a successful restaurateur. Though known for her innovative cuisine and artistic décor the life of a restaurateur and caterer were not to be her final calling. 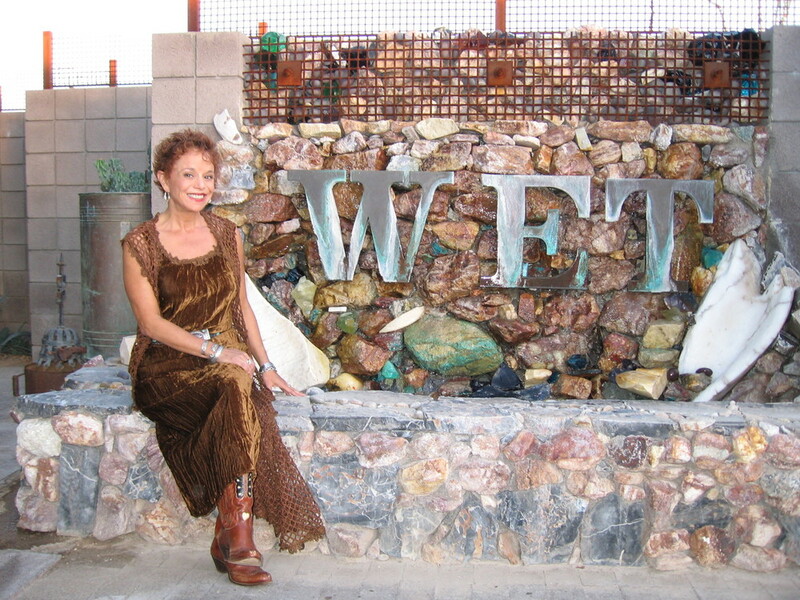 In 1982 Jan and her husband Tom moved their family to Scottsdale Arizona where her love of travel and exploration led to a rekindling of her work in fine art. In seeking out forgotten small towns, flea markets and hidden corners of the map, Jan's studio swelled with a rich collection of interesting and inspiring materials gathered from the places she visited. Traveling not only across the States but around the globe, Jan visited Australia, Bali, Turkey, Tahiti and Europe where her experiences in the United Kingdom would have profound influence on the “Crown Series” she was yet to create. This eclectic array of inspirations and influences combined with her education and innately artistic vision compelled Jan to express a lifetime of experiences through her artwork. True to her earliest influences Jan most often works in the mediums of mosaic and mixed media sculpture. Well known for her often large scale mosaics, Jan creates highly textural tableaus of glass, china, stone, metal and other repurposed materials. These mosaics adorn everything from furniture and fountains to exterior walls, kitchen and bath interiors. When working on commissions she will often incorporate objects contributed by her clients to create compelling works of art that transcend material and artistic value to become both sentimental and personal for their owners. In true artistic fashion Jan can be said to live her art. Her Scottsdale home, once a modest 1950's ranch style house, has been transformed into a well known showcase for her work. The house contains numerous sculptural walls, mosaics, and both standing and hanging artworks. Yet, the house only hints at the creative playground in the adjoining studio out back. It is here that Jan maintains the collection of glass, car parts, broken dolls and myriad other objects that are destined to become the art pieces she is increasingly known for. Moving further into three dimensions the latest evolution of Jan's work utilizes this ever changing collection of materials and objects to create intricate mixed media sculptures that can best be understood as “assemblages”. These highly tactile assemblages draw on a sophisticated sense of narrative to weave the history and intrigue of their countless parts into intuitively meaningful works of art. Her work is sought after by both corporate and private collectors and her home studio is a coveted venue for private events. In addition to television and magazine coverage, in 2006 she taught and hosted a Smithsonian sponsored mosaics workshop that we can only hope will be the first of many as Jan opens her home and heart to the greater art community.